If you’re considering buying music online, you may want to buy the actual files from online music stores like iTunes or Amazon instead of subscribing to a music service (like Zune or Rhapsody). The guarantee of your files being around, even if you never pay another cent to the store (if you remember to do your backups — you DO back up all of your files, right?). The ability to move your files wherever you want (depending on the guidelines imposed by the store). The ability to use them on a multitude of devices (again, depending on the guidelines of the store). You’ll have to pay for every song to listen to the entire track, so you’ll initially be out more money. 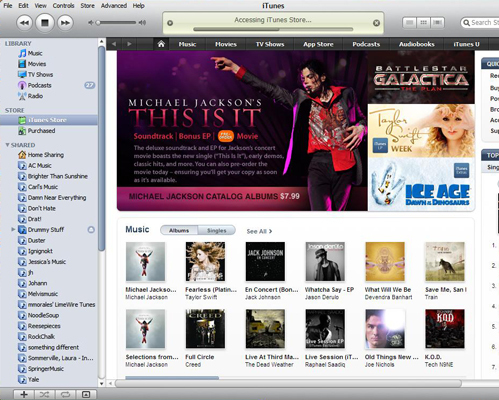 Some stores, like the iTunes store, have digital rights management software that restricts the devices you can use to play the music. If you don’t do the backups, the tracks are gone if the drive you’re storing them on dies (and it will die — it’s just a matter of when). As opposed to online stores, music subscription services like Zune and Rhapsody operate a bit differently. With a subscription service, you pay a monthly fee and you can access the service’s entire music database anywhere, anytime. But you don’t actually download the MP3s onto your computer or MP3 player. If you cancel the subscription, the music goes away. If you cancel your account with a music store like iTunes or Amazon, all the music you bought previously is still yours. Your decision on which kind of service to use depends on how you listen to your music.